Ujima Village Christian Church grew from a non-denominational urban youth outreach mission in Trenton, New Jersey. The children who participated in mission activities named the outreach after the Swahili concept of "ujima" (oo-JEE-ma), which refers to the mutual care and collective effort of harmonious communal life. On February 16, 1992, about a year and a half after the Ujima Youth Ministry was established, the families that had participated in the urban youth mission gathered as a multi-generational worshipping community. Honoring its roots, the church embraced the name chosen by the children, and the "Ujima Christian Church" was established as a non-denominational Christian Congregation. The former youth mission not only spawned our congregation, but also continues as "Ujima Ministries, Inc." providing social services and community development initiatives. Ujima Ministries redeveloped the former Odd Fellows Home, on the Ewing / Trenton border, into a multi use campus with social outreach services, low income housing for seniors and the disabled, and as a center for congregational life. 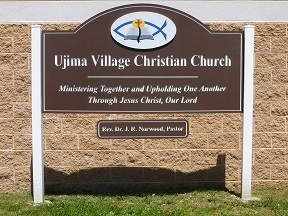 Since 1994, the Ujima Village Christian Church has met at its current location in the "Ujima Village," and continues its ministry to the surrounding community. We believe that the Bible is the Word of God and that only scripture may bind the conscience. We believe that salvation is by sovereign grace alone, through faith alone, in Christ alone. We believe that all glory belongs to the One Triune God alone. We are an assembly of Christians bound together to profess and uphold the Biblical Faith and to proclaim the Gospel of Jesus Christ through our unified witness, collective action, mutual support and accountability, all to the glory of God. We shall promote faithfulness to the biblical call exemplified in such scripture passages as the Great Commandment found in Matthew 22:37-40 and Great Commission found in Matthew 28:18-20, in addition to such core paradigms as the great requirement found in Micah 6:8, the great confession found in Matthew 16:13-19, the great standard found in John 15:9-17, and the great pursuit found in 1 Peter 1:14-15, and to live out the blessed example of Christian fellowship given in Acts 2:42-47 and 4:32-35 and demonstrating the characteristics of divine adoption found in Galatians 5:16-26. While remaining an independent, non-denominational congregation, the church is part of the World Reformed Fellowship and affirms the doctrinal positions of the Westminster Confession of Faith as a summary of biblical teachings.